In conducting my research on landmines, I started looking into demolitions as well and found a lot of useful information on this topic. So, instead of trying to write a combined story on explosives -- such as kaboomite -- and mines, I'm planning to create them as separate stories. Here now, is a look at expanding the demolition skill and adding some other explosives. Part art and part science, the Demolition skill in Star Frontiers provides characters with the ability to both set and defuse charges. Often this can be useful when a party of characters needs to blow open a security door or destroy a Sathar automatic cannon with just the right amount of kaboomite, while still having enough explosives for other potential uses. In the real world, besides its obvious military uses, explosives are used in mining operations, for clearing stumps in farmland, road construction, and razing buildings through implosion. A character with a demolition skill would be well versed in safety regulations. As a character gains experience, he should be able to not only set and defuse explosives, mines, and bombs, but also perform a number of other tasks such as analyzing a demolition site for the best place to set an explosive. Other sub-skills would include choosing the best blasting materials and techniques to handle a specific mission. The demolitions expert will be able to detect hidden explosives, including landmines, easier than normal characters. An expert can inspect the aftereffects of an explosion to determine if a structure that has suffered damage is safe to enter as well as perform a forensic analysis of any explosive residues. This character knows how to properly transport and store materials, timers, and other explosive devices. Besides Tornadium D-19, TD-20 and Plastid, an assortment of other materials could be available including blackpowder, nitroglycerin, dynamite, TNT, C4/Semtex, and Det Cord. Only a character with demolitions skill can legally buy or use explosives or detonators. There are eight sub-skills to the demolitions skill including the basic ability set charge and defuse charge. Demolitions experts can use type I missile warheads as mines plus use and throw an explosive damage pack. Setting and defusing charges or mines requires a skill check. This character knows how to properly transport and store materials, timers, and other explosive devices. Analyzing a demolition site might be as easy as looking at a locked door and knowing where to applying the right amount of TD-19 or TD-20 to blow it open. That would be an automatic check. But, when it comes to setting charges to achieve a complex desired effect, such as quarrying for valuable materials, causing a controlled avalanche of snow, setting exploratory charges for a ground penetrating radar for a geological survey, or properlydemolishing a building without causing damage to other nearby structures, demolitions is more of a combination of art and science. The set up time for complex explosions may be hours or days. Even then, the referee may require the character to make his “analyze demolition site” check at the time of the explosion. If the character fails the roll, the detonation does not happen as intended. This could result in leaving a badly damaged structure standing or, worse, throwing debris into the so-called “safety zone” that will damage other structures, vehicles, robots, or injure or kill bystanders. Only characters with this skill can set charges. The number of turns needed to set a charge is the character's skill level subtracted from seven. At first level, a character needs six turns to set a charge, but at sixth level he needs only one turn. If a character fails the skill check to set and detonate the charge, the charge has not exploded and must be re-set. The referee should feel free to have the charge explode prematurely or late if the skill roll results in an automatic failure. Charges can be detonated by timer, radio signal, weapon fire or other devices. A timer lets the character set a time when the charge will explode. The timer can be adjusted to delay from 1 second to 60 hours. If a chronocom or subspace radiois available, charges can be set to explode when a particular signal is beamed at them. The chance to explode a charge with a radio beam is 10 percent less than normal. Demolitions experts also can set off a charge with a laser. If the expert hits the charge, it explodes. A demolitions expert can try to defuse a charge that was set by another expert. Defusing a charge takes one turn, no matter what level the expert is. The expert's chance to succeed is his success rate modified by the bomb maker’s (set-up character’s) skill level. If the set-up character's skill level is higher, there is a -10 percent modifier to the skill check. If the defusing character's skill level is higher, there is a +10 percent modifier to the skill check. After successfully defusing a bomb, if a character is trying to defuse another charge set by the same bomber, he receives a +10 percent modifier. No other modifier exists if both characters are the same level in this skill. A character can defuse one of his charges automatically. Besides defusing a normal charge that was set by another demolitionist, the character may be called upon to defuse an unexploded bomb, missile or rocket warhead, etc. The best possible scenario is to explode such a device in place, if nothing critical around the weapon, but that is not always possible. A robot could be used – remotely operated by the character – to move the bomb to another location, where it can be detonated safely. Sometimes the character will have to move the weapon himself either the whole way or part of the distance to the “safe” location or to an explosion containment vessel. If the bomb cannot be moved (such as a nuclear weapon, nerve gas warhead, etc. ), the character can attempt to defuse it onsite. The chance of success is the character’s Dexterity or Logic score plus 5 percent per level. The referee could then apply any penalties, such as minus 10 percent per the bomb’s sophistication level. Assume that most modern bombs – even nuclear warheads – have a level of 1; if it is a primitive explosive, such as a pipe bomb or an iron cannon ball with a lit fuse, assume the bomb’s level is 0 or even give the character a bonus to defuse it. If the characteris trying to defuse an unexploded alien bomb, such as a Sathar device, he receives a minus 30 percent penalty. If the character fails his roll by 20 points or less, the bomb does not explode and he can try to disarm it again. If the character fails the roll by more than 20 points, he has 1-10 turns to flee before the weapon explodes. A roll of 99-00 is an automatic failure, resulting in an immediate explosion. At a low level, the character has the knowledge to create simple explosive compounds including primitive black powder, nitroglycerin, while at higher levels he can mix up more sophisticated compounds. For example, a character can easily manufacture small explosives one-tenth the strength of TD-19 for around 12 Credits. If the character fails his roll by 20 points or less, the compound does not explode. The components must be disposed. If the character fails the roll by more than 20 points, he has 1-10 turns to flee before the mixture explodes. A roll of 99-00 is an automatic failure, resulting in an immediate explosion. Because of the character’s knowledge about explosives, the demolition expert has a greater chance to spot the telltale signs that a grenade, landmine, bomb, etc. has been set as a trap. A roll to find a generic explosive would be the character’s Intuition score plus 5 percent per skill level. If the referee has decided that the explosive device has been specially camouflaged, then the success rate is modified. The character has a +10 percent per skill level to detect the weapon but then subtract 10 percent per the setter’s skill level. The referee could then decide that other factors help or degrade the expert’s detection capability such as the presence of halo fields or if the character is using specialized mine/explosive detection equipment or even a “bomb sniffing dog” or bomb detecting robot. When the character reaches a third level in demolitions, he becomes skilled enough to conduct a forensic examination of defused unexploded bombs and to inspect the aftereffects of an explosion to find any explosive residues. The character cana lso determine if a structure that has suffered damage is safe to enter. An investigator can determine if an explosion actually occurred by looking for telltale signs of damage. Next, the character would need to search far and wide for possible fragments because debris can be thrown far away from the epicenter of an explosion due to the kinetic energy and heat generated. Once enough fragments have been found, including the remains of any detonators, wires, batteries, switches, etc., the character can look for things such as fingerprints (if it was set by a race that has “fingerprints”) to try to find the perpetrator. At least a forensic examination may be able to determine if it is similar to devices used by known criminals or terrorist groups. “Explosives,” The Forensics Library, http://aboutforensics.co.uk/explosives/. Black powder was invented in the 9th century A.D. by Chinese alchemists during the Han Dynasty. Ironically, they were trying to develop an immortality elixir rather than a substance that would be used to end lives. Made from sulfur, charcoal, and saltpeter (potassium nitrate), black powder is the original gunpowder. The early ratio of ingredients for black powder was 1 part sulfur: 3 parts charcoal: 9 parts saltpeter; later experiments in Europe refined the ratio to 10 percent sulphur, 15 percent charcoal and 75 percent potassium nitrate. Knowledge of the formula spread along the Silk Road trade route from China to Europe. Although the Chinese used gunpowder to develop fireworks, due to the scarcity of saltpeter, it was mostly used for military purposes rather than for civil mining or demolition work. Black powder was probably used in mines and for even road work – for military reasons – by the mid-15th century. However, it was still prohibitively expensive for such applications because many governments considered saltpeter to be a strategic resource. As the use of black powder for mining became more common, it limited to excavating less valuable materials such as coarse stone and limestone or for removing undesirable rocks. It was discovered that the blast would fragment or crack more desirable materials such as marble. It was also used extensively for railroad construction and tunneling. Nitroglycerin then became another widely used explosive. Vergani, Raffaelo. “The civil usesof gunpowder: demolishing, quarrying, and mining (15th-18th centuries). Areappraisal.” XXXXIV Settimana di studi dell'Istituto internazionale di Storiaeconomica "F. Datini" (Prato, Italy), April 15-19 2002). “Black powder,” New WorldEncyclopedia, http://www.newworldencyclopedia.org/entry/Black_powder. Although used as a heart medication, nitroglycerin was developed in 1847 in Toronto. In its pure form, it flammable and explosive oil that has a clear to colorless yellow appearance. It has aboute ight times the explosive power of a similar quantity of black powder, so it was put to use for tunneling and mining. However, nitroglycerin is extremely unstable and dangerous. The slightest jot, shock or bump can cause it to explode. It can be frozen at 5-10 degrees Celsius, which “desensitizes” it, making it safer to handle. But if thawed too rapidly, it becomes extremely sensitive to shocks. It will also spontaneously explode when it enters the 50-60 degree Celsius range. For use in construction, companies employed a chemist on-site to mix up a batch of nitroglycerin because transporting it was dangerous. After several catastrophes, it was banned in a number of countries, leading Alfred Nobel to create dynamite by mixing nitroglycerin with various inert materials in order to stabilize it. Now time for an aside on my descriptions. I'm thinking ahead as to how to define the destructive power of say, a keg of black powder, a jar of nitrogylcerin, a stick of dynamite, a stick of TNT, etc. and how to translate that into game statistics. Howmuch energy is in an SEU? Watt (w) a measure of power. 1 w = 1 J per second. Let's start with the fact that a 1 SEU laser shot does the same damage as a autopistol/rifle. Also note that a burst does an extra 4d10. I'm going to call this the burst bonus. So without that bonus, a machine gun does 6d10 of damage. Let's pretend that works. If we assume that an autopistol is about equal to a .380 (250 J), that would mean a machine gun is about 1.5kJ, so it would be a 5.56 or 7.62 Soviet type round. If we went with 500 J, about the same as a 9mm, the machine gun would be like the M-60 used today. Neat. So a laser pistol would have an energy output from 250 J to 2500 J, about the same range from a 380 ACP to a .500 S&W and an SEU could be 250 J. Typical efficient cars today use .250-.350kwh per km traveled. The Nissan Leaf uses .212. The Alpha Dawn ground car is actually lower performance than the Leaf but the one in SFMan #8 is similar to the Leaf so let's use the low value. The ground car has a 1000 SEU battery and a 1000 km range so it conveniently uses half a SEU per km traveled. Using the Leaf's value, that means 1 SEU = 0.212 kwh or 1472 kJ. The .350 value gives us an SEU value of 2.5 MJ. Conveniently, with a range of 1000km and a top speed of 900kph, an aircar has an endurance of 4000 seconds so it uses 1 SEU per second. So it uses 112 MW or 112 MJ per second. If they are using energy at the same rate we are, an SEU would be 10-20 MJ. I think a higher rate (hover carsa nd robots) is appropriate so I'd say 50-200 MJ per SEU. For the estimate, let's match the aircar. Standard Energy Units (SEU) are a standardized unit of measurement in the Frontiercommonly used for power supplies. They measure the output of a Power Generator, and the capacity of power packs and batteries. Prior to the introduction of the Credit, SEU were used inmany places as a form of universal currency. They still are used as a trade commodity in remote places where other forms of banking are not available. They are valued at 5 credits each. SEUs are generally stored in multi-capacitor, single-use (i.e. non-rechargeable) devices such as Powerclips, mini-powerclips and power discs, or in rechargeable active-matrix devices such as Power Beltpacks ,Power Backpacks and Parabatteries. 2. ? For purposes of basic reference, 1 SEU has been calculated to be the equivalent of approximately 1,000 joules (1 kJ). I'm no mathematician, but I think you can see the numbers above to estimate the value of an SEU are all over the place. So, I might go to "Handwavum" University and come up with some kind of figures later for other explosives. Here's a cautionary note about Internet research. Several online sources mistakenly give Toronto as the location where nitorgylcerin was invented. It was actually in Turin, Italy! Well, the information above is a first draft and I am posting it for any review comments. do becareful with internet research. I suspect Toronto/ Turin was autocorrect strikes again compounded by numerous cut and paste operations. With the variety of different munitions on the Frontier – everything from explosive charges to tangler grenades and sonic warheads – the average citizen is not necessarily going to know what kind of unexploded bomb or grenade they are looking at. But, the demolitions expert should be able identify most grenades, bombs, missile warheads, rockets, landmines, etc. through either a glance or a careful examination. The Tang Dynasty, not the Han Dynasty. Poulton, Mike. “Is a quarter stick of dynamite the same as an M80 firework? Ifnot, what’s the difference?” Quora, https://www.quora.com/Is-a-quarter-stick-of-dynamite-the-same-as-an-M80-firework-If-not-what-s-the-difference,13 February 2019. A stick of dynamite thus produced contains roughly 1 MJ (megajoule) of energy. A megajoule = 1 million joules = 1,000 kJ = 1 SEU? The whole SEU concept needs a complete redo including the idea that all vehicles run around powered by just batteries. Why not fuel cells and a battery pack? At least that's more reasonable. Back to dynamite, it would only do its full damage if set in place. Another source noted that in the open air, a dynamite explosion is not as powerful as when it is placed because there is nothing to contain the blast. "...the force emanates outward in a somewhat spherical shockwave, thus the force drops off at a cube root of the distance (at 10 feet the explosion is 1/8 the strength it is at 5 feet." So a character lighting and throwing a stick of dynamite (without anything wrapped around it to create shrapnel) may be more for a scare tactic. Though it can cause damage. 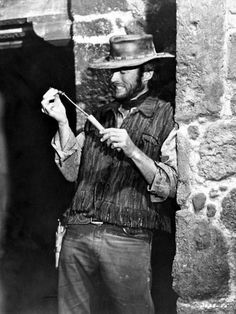 Clint Eastwood lights a stick of dynamite! "Calculate effect in terms of the strength of the blast and the radius of effect in yards. Example; a stick of dynamite does 5D6 damage in the first two yards, 4D6 in the third yard, 3D6 in the fourth, and so on. Each victim takes separate full damage. Doubling a charge increases damage by half. " So 2 sticks do 7.5D6, 4 sticks do 11.25D6, 8 sticks do 16.875D6, 16 sticks do 25.2D6. 12 sticks would do roughly 21D6 or 21 to 125 damage in the first 2 yards/meters, roughly 16D6 in the third yard/meter, roughly 12D6 in the fourth yard/meter and so on. I'd decrease it by four dice for each extra yard/meter down to zero more than 7 yards/meters from the blast. Distance should be exponential, double the distance, quarter the damage. This is not stated in the rules, but that is how explosive force works and also makes it easy. The book example is linear which will result in a much larger blast radius compared to the real life numbers. Not a huge deal with small charges, but quickly unmanagable on large ones. Book example 2yd 5d6, 3yd 4d6, 4yd 3d6, 5yd 2d6 6 yd 1d6 vs 2yd 5d6, 4 yd 1d6. Taking a Mk3A2 offensive (aka concussion) grenade which holds 1/2 lb of TNT (roughly equal to 1 stick of dynamite) in an on fragmenting fiberboard case. It is listed as having an effective casualty radius of 2 meters in the open (closed spaces increase blast damage). Following the 5d6 for 1 stick of dynamite, exactly following the rules would still have the blast be equal to a rifle shot at 6 yds, while the formula I list has it doing 1d6 at 4 yds (still double the listed effective radius). So accepting the 12 stick example numbers are correct, you would get 2yd 21d6, 4yd 5d6, 8yd 3d6, 16yd 1d6 following the 1/4damage for each doubling of range, while the book example would be doing damage out to 21 yds, losing 1d per yard (not sure where the poster above got the drop by 4d6 per yard). A 500lb aircraft bomb (approximately 200lbs of explosive filler or 400 sticks of dynamite, not even going to do the math) has an explosive blast radius of 13 meters, with effective fragmentation to 40+meters. -1d6 per yard would greatly exceed both the blast and fragmentation given by the military. So, 1 pound equals approximately 0.45 kilograms. A stick of dynamite weighs 190 grams (1/2 troy pound). About five sticks would almost equal 1 kilogram. ... for ease of conversion, let's say in the Frontier that the weight of a stick of dynamite or a stick of TNT is 200 grams. 5 sticks equals 1 kg. 1 stick dynamite/TNT = 10d10 points of damage in an open air blast. Primary blast radius of 2 meters, a secondary blast radius of 5d10 out to 4 meters. A thrown stick does full damage to living beings (and soft targets) but only half damage to structures (including robots and vehicles). It does 50 structure points of damage if placed. Although used in modern times as a heart medication, nitroglycerin was invented in 1847 in Turin, Italy, by student chemist Ascanio Sobrero who was working under Théophile-JulesPelouze. Adding glycerol to a mixture of nitric and sulfuric acids, Sobrero placed a minute quantity of the colorless liquid on his tongue and discovered it had a sweet, burning taste. It also gave him a terrible headache. In another experiment, Sobrero heated a drop of the liquid in a test tube. It exploded, spraying glass fragments everywhere. Scarred on his face and hands from the explosion, Sobrero called the liquid “pyrogylcerine” and warned that it was far too dangerous to be of any practical use. By 1851 another student, Alfred Nobel, had begun studying chemistry under Pelouze. Recognizing the potential of nitroglycerin for demolitions – it has about eight times the explosive power of a similar quantity of black powder – Nobel went on to manufacture it for various uses, including tunneling and mining. Yet, the liquid’s instability led to a numberof catastrophes, including a September 1864 explosion that killed Nobel’s younger brother, Emil, as he was fulfilling a nitroglycerin order for a railroad company. Several countries banned the use of nitroglycerin, but Alfred Nobel undertook a number of experiments to mix it with various inert materials in order to stabilize it, leading to the creation of dynamite. The invention of dynamite came about by accident as Nobel’s company added different absorbent materials, including sawdust, to nitroglycerin to make it more stable for transport. He found that mixing diatomaceous earth – which mostly contains silica from fossilized plankton – with nitroglycerin created a stable past that could be shaped and detonated upon command. Patenting his invention in 1867, Nobel called it dynamite after the Greek word for power, which is dynamis. A typical stick of dynamite is about 8 inches long, 1.25 inches in diameter and weighs about three ounces. It is normally set off using a blasting cap, which itself is about as powerful as an M-80 firecracker. A stick of dynamite has the power of about 1megajoule (MJ) of energy, which can split and move about a cubic yard of rock, which weighs a little over 1 English ton. Another way to look at it, 1 MJ is approximately the kinetic energy needed to move a 1 metric ton vehicle (1,000 kilograms) at 161 kilometers per hour. Depending upon how it was made, older types of dynamite could freeze and would not explode unless thawed.As dynamite ages, it begins to weep nitroglycerin, which can crystalize on the outside of the stick or pool at the bottom of a storage container. In this condition, if the material is jarred, the nitroglycerin can become unstable and explode. Although the names dynamite and TNT are sometimes used interchangeably by the public – such as the AC/DC song “T.N.T.” – these explosives are not the same. Originally produced as a canary yellow dye in 1862 by German chemist Julius Wilbrand, the compound 2,4,6-Trinitrotoluen (TNT) was not recognized as an explosive until the 1890s. It is toxic. The skin of workers exposed to it could turn bright yellow-orange and it can cause blood, liver, spleen ailments along with harming the immune system. As an explosive, TNT is more stable than dynamite. It can be melted and then poured into containers, but will not explode without the use of a detonator. The Germans would use this new explosive to great effect. During the Battle of Liègein August 1914, which was the first battle of World War I as the Germans invaded Belgium, “the world at large became acquainted with a new and powerful military explosive whose cabalistic symbol, T.N.T., acquired a horrifying worldwide significance almost overnight,” noted a 1917 story in the Engineering and Mining Journal. Fairly easy to manufacture, TNT was a relatively safe explosive that could be used for controlled demolitions. Although an equivalent stick of TNT is not quite as powerful as dynamite, it soon became the standard measure for bombs and other explosives. A large mining and excavation site might approximately 4,000 pounds (1,823.4kilograms) of dynamite to complete a single blast for a “two ton explosion.” Later nuclear weapons are measured in megatons (the equivalent to a billion or more sticks of TNT). Another invention by Nobel was gelignite, which was the first plastic explosive. First made in 1875, gelignite could be molded into various shapes without detonating. The military soon put plastic explosives – often abbreviated as PE – to work to destroy doors and bridges. British Special Forces used it extensively during sabotage missions in Nazi-occupied France during World War II. Also during the war, the chemical RDX orcyclotrimethylene-trinitramine was mixed with TNT to create the bouncing bombs dropped on German hydroelectric dams in Operation Chastise. Later, RDX became the basis for the development of the Composition C family of plastic explosives such as C-4 PE. Molded into any desired shape, C4 can be pressed into gaps, cracks, holes and voids in buildings, bridges, equipment or machinery, noted Military.com. A very stable explosive, it cannot be detonated by a gunshots or by dropping it. C4 will not explode when set on fire or exposed to microwave radiation. “Detonation can only be initiated by a combination of extreme heat and a shockwave, such as when a detonator inserted into it is fired,” Military.com reported. Shaped charges were first created by Max von Foerster in 1883 by focusing the blast energy in a single direction by the use of a conical liner. During a normal explosion, the blast force radiates evenly outward from the detonation point. In November 2012, some 100 kilograms of explosives – 64 charges in all – were used to bring down an old 17-story apartment tower in the city of Motherwell, Scotland. It was an example of the scientific aspects of demolitions to precisely bring down a building. Yet, demolitions remains part art as well, where not everything can be anticipated. Some notable examples of demolition failures would include the December2014 attempt to implode a 10-story apartment building in the city of Sevastopol. Instead the explosion left the structure dangerously leaning one way as many of the upper floors simple pancaked on top of the floor that was destroyed. In another case, in Cankirl, Turkey, the effort to demolish an 80-foot-tall factory building went awry as the structure did a barrel roll instead of being demolished as planned. This disaster was caused by a failure to anticipate how the sandy ground would interact with the explosion. Along with the civil uses of demolitions, explosives have gone off accidentally, causing much destruction not to mention criminal or terrorist uses of anything from pipe bombs, to suitcase-size bombs all the way up to semi-trucks loaded with explosives. Cheong, Shahan. “A Blast fromthe Past: The Creation of Dynamite,” https://www.throughouthistory.com/?p=1222, 21 March 2011. Poulton, Mike. “Is a quarterstick of dynamite the same as an M80 firework? If not, what’s the difference?”Quora, https://www.quora.com/Is-a-quarter-stick-of-dynamite-the-same-as-an-M80-firework-If-not-what-s-the-difference, 13 February 2019. Dozolme, Philippe. “TheExplosives Used in Mining,” The Balance,https://www.thebalance.com/explosives-used-in-mining-an-overview-2367467 ,updated 21 June 2018. Schermerhorn, Louis Y. “ModernHigh Explosives,” The Iron Age, 28 July 1898. “Old dynamite poses a danger,”MacLeod Gazette, http://www.fortmacleodgazette.com/2016/old-dynamite-poses-potential-danger/, 23 November 2016. “Trinitrotoluol,” Engineering andMining Journal, 16 June 1917. Finney, Laura. “5 of the mostpowerful non-nuclear explosives ever,” Business Insider, https://www.businessinsider.com/most-powerful-explosives-2017-2,17 Feb. 2017. “Damage of one stick ofdynamite,” DSLReports.com, http://www.dslreports.com/forum/r21659321-Damager-of-one-stick-of-dynamite-used-in-mining-an-overview-2367467,updated 21 June 2018. Chia, Jacky. “Boom: TheEvolution of Explosives,” https://www.defencetalk.com/boom-the-evolution-of-explosives-63754/,DefenceTalk.com, 8 April 2015. Sims, Josh. “The art ofdemolition: Bringing down a multi-storey structure is a process that is asscientific as it is creative,” (U.K.) Independent, 5 January 2010. “Demolition fail: Russia getsown leaning tower of Pisa after building explosion goes wrong,” news.com.au, 28December 2014. Sims. “The art of demolition,”2010. Wikipedia on black powder: "Gunpowder releases 3 megajoules per kilogram and contains its own oxidant. This is lower than TNT (4.7 megajoules per kilogram)..."
So, one "full stick" of dynamite used by construction and demolition crews is generally enough to move and split one cubic yard of rock. A cubic yard of rock weighs a little over 1 ton - around 2200 pounds. And a stick of dynamite contains roughly1 MJ (megajoule) of energy. And, repeating myself from above: "let's say in the Frontier that the weight of a stick of dynamite or a stick of TNT is 200 grams. 5 sticks equals 1 kg. "1 stick dynamite/TNT = 10d10 points of damage in an open air blast. Primary blast radius of 2 meters, a secondary blast radius of 5d10 out to 4 meters. A thrown stick does full damage to living beings (and soft targets) but only half damage to structures (including robots and vehicles). It does 50 structure points ofdamage if placed." so1 kg TNT = 40d10 damage? 45d10? 1kg of black powder = 3 MJ = 30d10 points of damage? my thoughts keep real world explosives off the equipment list and just have things with fantasy/sci-fi names. However, keeping real world explosives off the equipment list is not the same as writing it up. I converted the Reaper drone to SF just to do it and its just not something the PCs should have access to on a regular basis.or the NPC to use against the PCs. it has similar damage expressions just using stuff of the Tanks Again article. Not to worry. I'm still crunching some ideas. Real world stuff should work once I can figure out a good game mechanic/translation. The DnD and Call of Cthulu (did I spell that right?) offer some good clues on how to do a proper SF conversion. The three most common demolitions available to characters include Tornadium D-19 (TD-19), sometimes called kaboomite, a special shaped charge called Tornadium D-20 (TD-20), and Plastid. As noted earlier, explosives can only be bought legally by someone with a Demolitions skill. They have a number of purposes on the Frontier including for mining, oil and gas exploration; demolishing buildings; avalanche control; removal of tree stumps on farmland; along with use in special industrial tools, airbag inflators, and more. Great care should be taken for the transport and storage of certain types of explosives. For purposes of comparison, TNT will remain the standard for judging the effects of other explosives. One “full stick" of TNT is generally enough to move and split one cubic meter of rock. A cubic meter of rock weighs between 2.5 and 3 tons. A stick contains roughly 1 megajoule (MJ) of energy. TNT and the like are cause “high order explosions,” producing a very hot, dense, high-pressure gas. Expanding at very high velocities, the explosion’s shock wave radiates out from the source of the explosion ats upersonic velocities. But, only one-third of the chemical energy available in most explosives is released during the detonation. The remaining chemical energy is released more slowly causing an afterburning process. So, one of the best defenses against bomb – besides having an armored vehicle or building – is the distance from the source of the explosion. While the Alpha Dawn rules regarding Tornadium D-19 state that a 50-gram charge will do 5d10 points of damage to anyone and anything within 1 meter of the explosion and that the blast radius increases 1 meter for every 100 grams used, in reality, after a certain point, this formula does not match reality. “Explosives,” Bureau of Alcohol, Tobacco, Firearms and Explosives, https://www.atf.gov/explosives, April 6, 2019. The Defense Threat Reduction Agency provides a chart aboutthe blast ranges of a certain amount of explosives versus the distance in feet.This could be a guide for a referee wanting to simulate large explosions basedon a the yield of TNT in pounds. The Defense Threat Reduction Agency provides a chart about the blast ranges of a certain amount of explosives versus the distance in feet. This could be a guide for a referee wanting to simulate large explosions based on a the yield of TNT in pounds.